The lights have already gone up on Oxford Street and people are reaching into the depths of their wardrobes to dust off their winter coats. As we transition into winter, there’s only one important thing in everybody’s mind: Christmas! 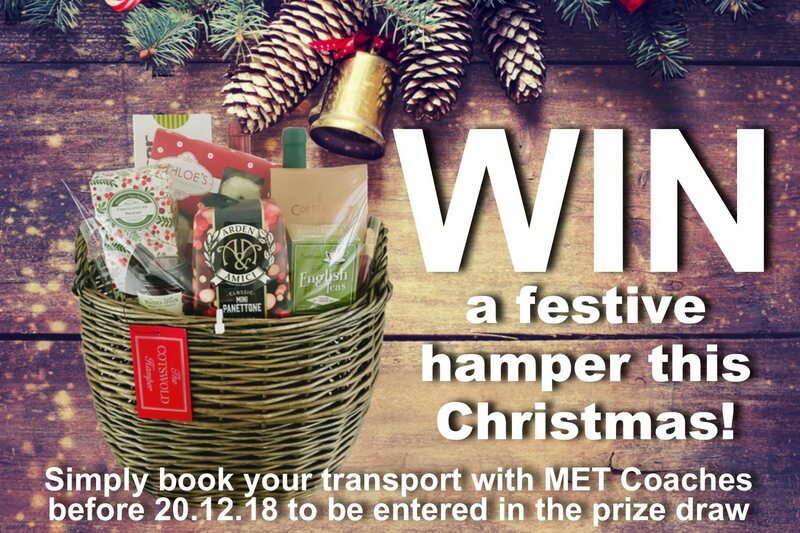 At MET Coaches, we enjoy the seasonal festivities, and as it’s the season of giving, we’re giving away a free festive hamper to the lucky winner of our Christmas prize draw. To enter, book your minibus or coach transport with us before 20 December 2018. Whether it’s to organise a family trip to London, Christmas-themed corporate event or a small festive dinner with clients or delegates, it’s never too early to start planning your Christmas event. Remember to book a minibus or coach with us before 20 December 2018 for a chance to win this fantastic festive hamper. The prize draw winner will be announced on 21 December 2018. Use our quick quote form for an insight into our competitive prices. Alternatively, you can call us on 01923 247765 to speak to a member of MET Coaches staff directly.